Dwayne Ferguson (green shirt) of MADDADS and the Rev. D.L. 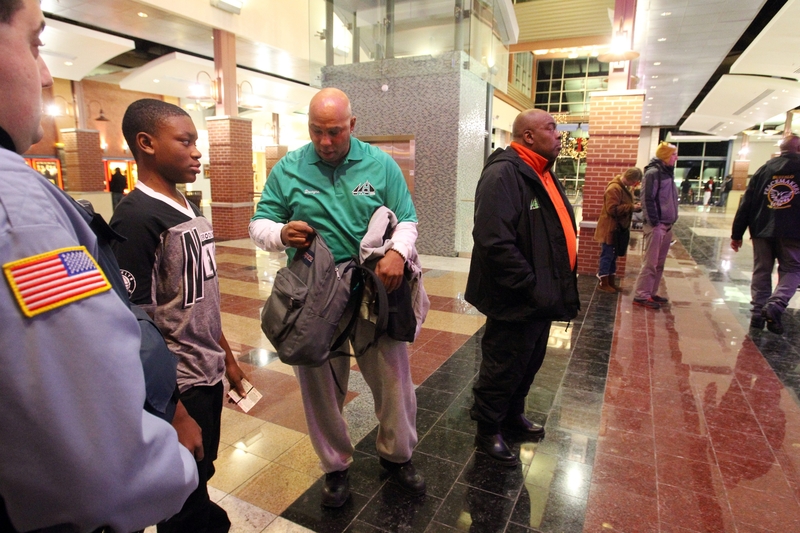 Young (in red shirt) talk to kids and inspect their bags outside the Walden Galleria cinemas in Cheektowaga on Jan. 3, 2014. The felony charge of second-degree criminal possession of a weapon was dropped after it was determined that Ferguson has a permit for the gun he was found carrying Feb. 6 at Harvey Austin Elementary School, according to First Assistant District Attorney Michael J. Flaherty. But Ferguson still faces a felony charge of criminal possession of a weapon on school grounds and a misdemeanor count of obstructing governmental administration. The dismissed weapon charge carries a maximum prison sentence of up to 15 years, while the remaining weapon charge involves a maximum sentence of up to four years. Flaherty said the charge of weapon possession on school grounds had been a misdemeanor but was made a felony under the NY SAFE Act, which Gov. Andrew M. Cuomo signed into law last year. The obstruction charge carries a maximum sentence of one year in jail. Ferguson, 52, of Butler Avenue, was in City Court on Thursday for a felony hearing, but his attorney, Joseph A. Agro, waived the hearing. The case will be presented to an Erie County grand jury or resolved in some other manner in county or state court. The school on Sycamore Street was put on lockdown shortly after 4 p.m. Feb. 6 when the school office received an anonymous call that there was a man with a gun on or near the school property. About 60 students were in the building for after-school programs. About 15 patrol cars responded to the scene, and the lockdown ended about four hours later when Ferguson was arrested. He pleaded not guilty and was released on his own recognizance. Ferguson, longtime president of the MAD DADS Buffalo chapter and a volunteer with Buffalo Peacemakers, which seeks to defuse violence in neighborhoods and at public events, has worked with at-risk youth in after-school programs in various city schools for several years.